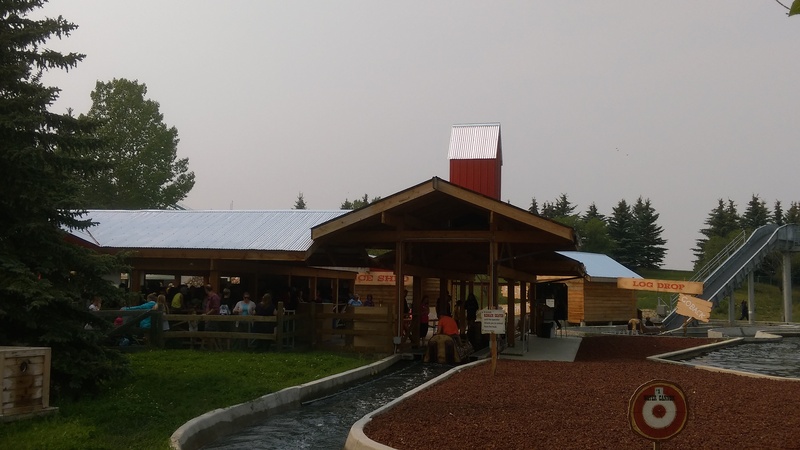 After Whitewater West Industries Ltd acquired Hopkins Rides in 2012, they turned their focus to the dry park water attractions that had made O D Hopkins so successful. 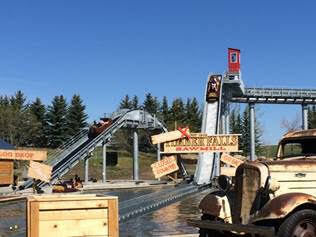 The first Whitewater Attractions log flume is the brand new Timber Falls at Calaway Park (Calgary, Alberta). It had a soft opening in late 2014 and officially premiered this summer. 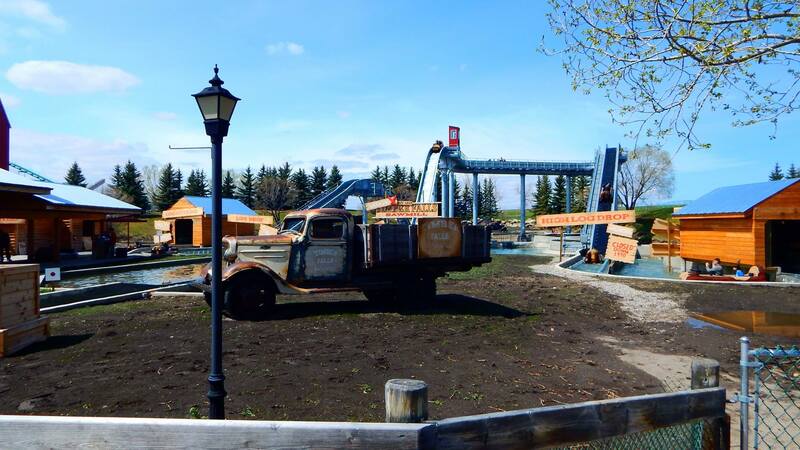 This ride has a particular history as Calaway Park most popular attraction was always their log flume, which opened with the park in 1982. But, it was a very early Hopkins ride with slow loading, still featuring a double station with the original stop/go Hopkins loading system. 360 riders per hour was simply not enough to meet the demand, so in late 2013, it was retired. 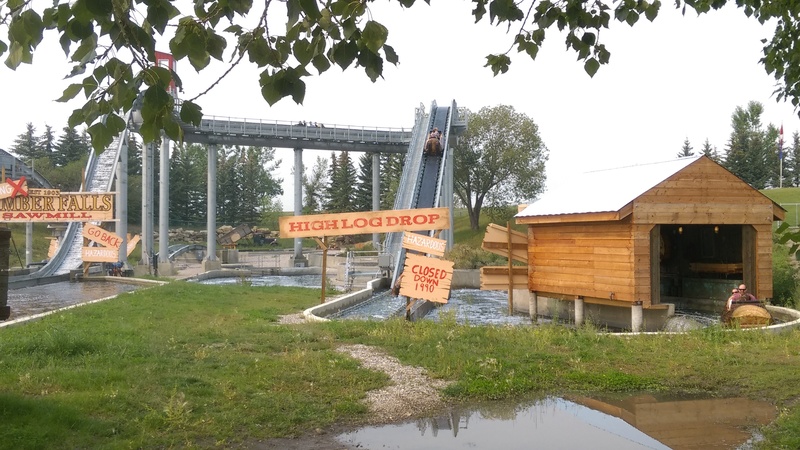 The original log ride had two drops and a short layout on the ground while the brand new Timber Falls still has 2 drops and a course that is 200 feet longer. 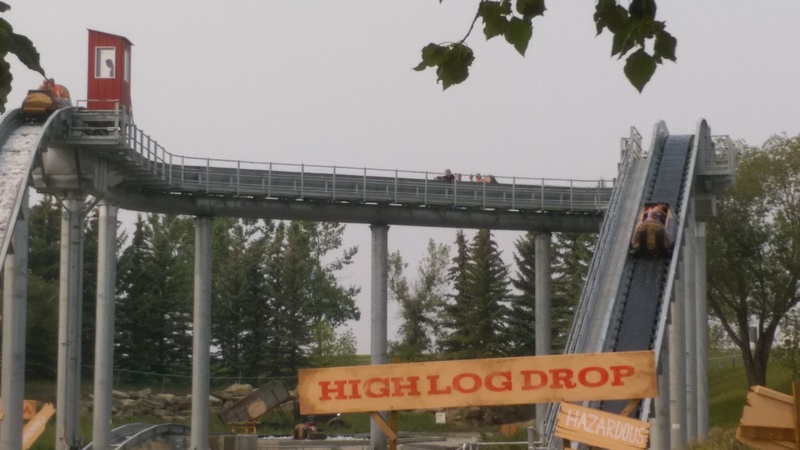 The first drop is now a very rare “Coaster Drop”, making it unique among water rides in Canada. The capacity issue was also fixed with continuous loading using the slow station belt method. The park is also proud to say that this is their first ever themed attraction. You can see the conveyor belt used in the station. The roomy and comfortable logs. The log exit the station, goes through the first themed shack and then turns back toward the first lift hill. The Coaster Drop is off that lift. 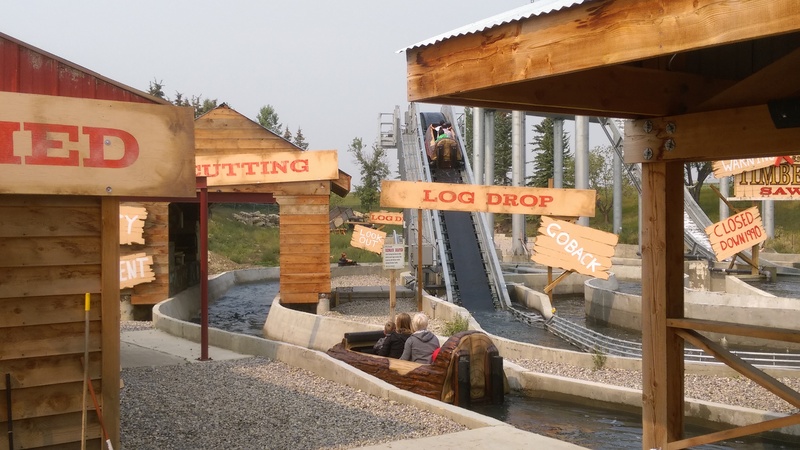 The ride features a long elevated portion that the logs float in. 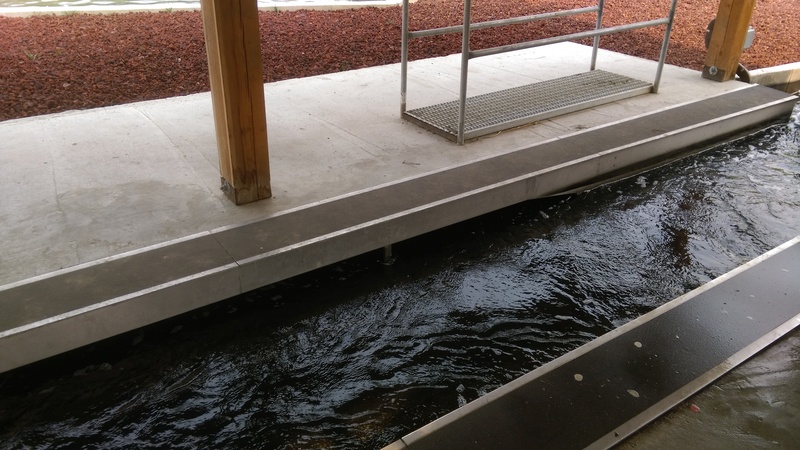 The ride was nicely themed by the park and now features a ecologically sound layout that conserves all the water that is used in the trough. Large enough splash pools were designed in so that all the water that splashes around after a drop remains in the ride system. The park estimates that the only water losses will be due to evaporation and what riders will carry on them after riding. The second themed shack can be seen in this picture. 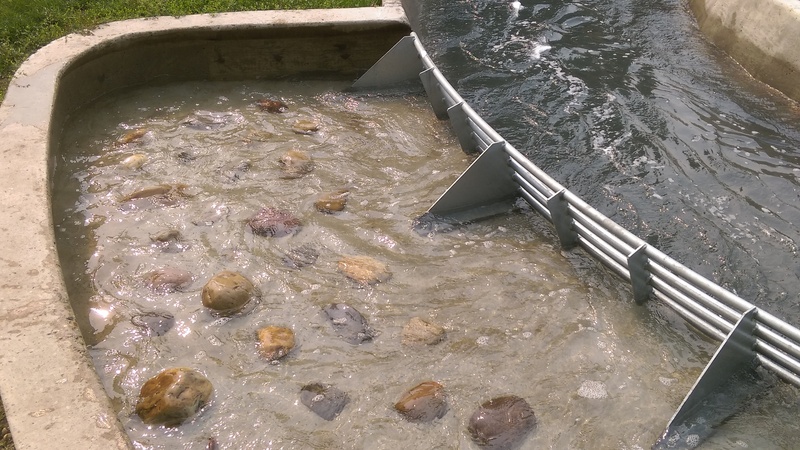 Notice the high cement channel to contain the water. The last turn into the station has a themed catchment area. You can see an overview here of the waiting line and station building. 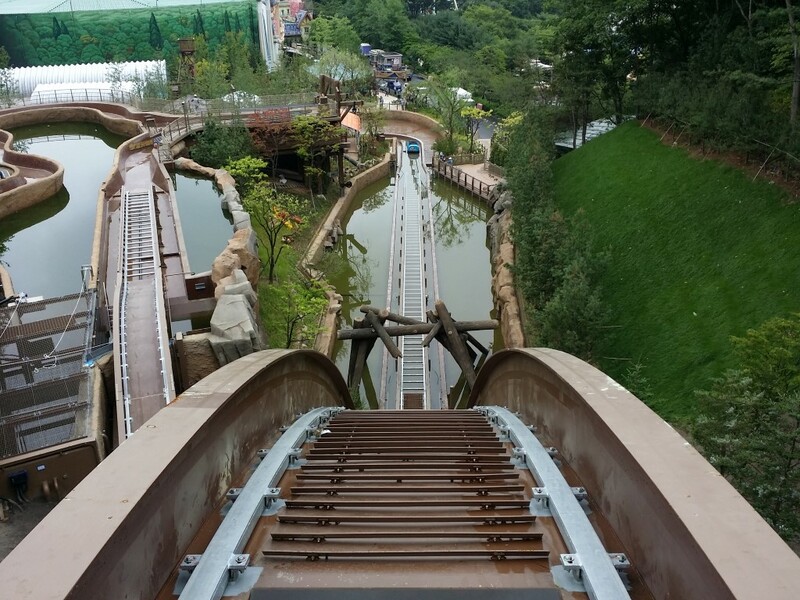 In July 2015, Everland (Yongin, South Korea) premiered the first new Super Flume in over 10 years. 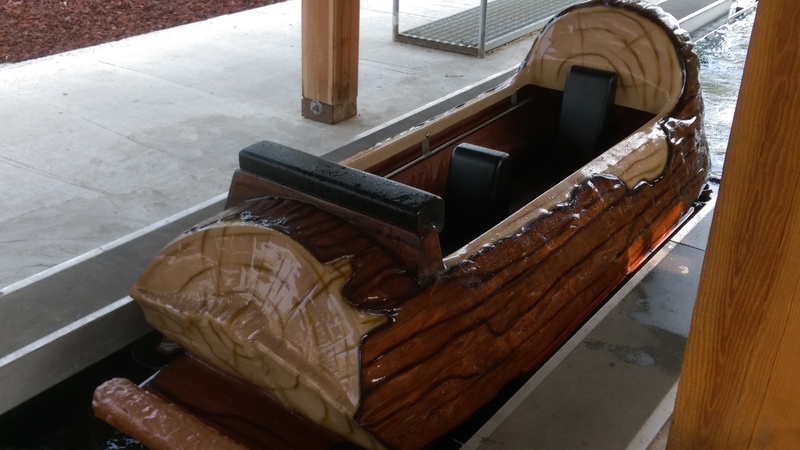 The park named it the Thunder Falls Rafting Adventure and it features a two drops layout, with the first one being a dramatic backward Coaster Drop. 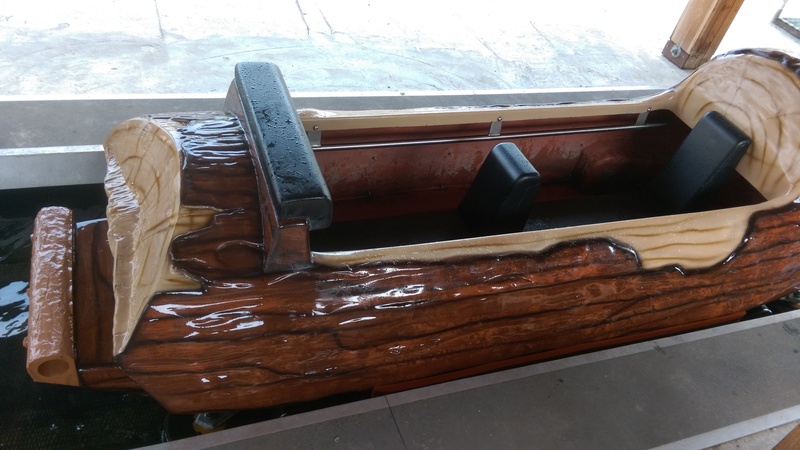 A custom fleet of 8 passenger boats with various colors were designed and manufactured/ For higher capacity than the traditional flume it replaces, riders sit two to a row and a comfortable lap restraint secures each pair of riders. An additional upgrade was the longer ride duration, with the ride having a 1591 feet long channel versus 1453 feet for the older attraction. The ride design is solid, with smaller conveyor belts lifting the boats out of the water so that they can smoothly engage the single chain lift hills. It also has the effect of extending the life of the chain as it does have not be submerged in water at the bottom. Three lift hills are used on this attraction with the second being the tallest and the first lift hill take riders up a hill where the boat then floats down to the the first turntable. The last lift hill is used at the end to bring the boats back to the station. WhiteWater Attractions provided this incredible picture of the ride’s second drop. Standing 66 feet tall and dropping at a 45 degrees, it is quite an improvement over the old flume it replaced. The turntables here have an efficient design with the boat coming off a lift or conveyor belt and being driven onto pairs of vertical pusher tires. This has the effect of being a method where you have full control over the boats and do not need to design further devices around it. Once the boat is in position, the tires then move the boat out. Interestingly, both drops and turntables have a stacked design here. To avoid having a longer and more expensive elevated trough, once the boat reaches the top of the second lift hill, the turntable will simply spin it around and align it with the drop. Further information and pictures will be coming soon. This entry was posted in Water Ride and tagged calaway park, Coaster Drop, Everland, South Korea, Super Flume, Thunder Falls, Timber Falls, WhiteWater Attractions, whitewater west. Bookmark the permalink.